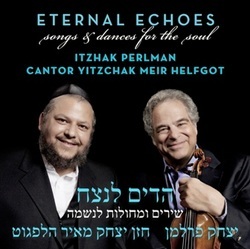 Violinist Itzhak Perlman and Cantor Yitzchak Meir Helfgot, and arranger/co-producer Hankus Netsky, talked about their new SONY Masterworks CD “Eternal Echoes: Songs and Dances for the Soul.” The event was a unique chance to hear the inside story of the new recording, preview some of the pieces included on the disc, and ask questions of these wonderful artists. The discussion was moderated by Dr. Arbie Orenstein, th Co-Editor of Musica Judaica, the Society's journal. Following the event there wasl a CD signing in the Great Hall at the Center. Video excerpt from the event will be posted on the site soon. In the meantime . . . .